3 carrier 5H80 compresses driven by 75HP motors in direct drive, tandem configuration. System utilizes independent discharge oil separators. System shares common discharge and suction with check valves on the discharge line. Oil system utilizes a typical oil skimmer line configuration, skimmed off of the evaporator at 60% desired liquid flooded level. Utilizes a suction surge drum to promote liquid free suction gas. Refrigerant/oil mixture is delivered to a batch oil pot, is heated to 120°F. Oil is then pressurized by discharge oil separator gas and superheated refrigerant pressure. R22 refrigerant change of approximately 3,000 lbs. Alkyl benzene 300 oil is being utilized. Removed approximately 3,000 lbs. of R22 refrigerant and alkyl benzene oil. Serviced two of three compressors and changed out several critical system components. Performed vacuum/dehydration process, pulled system to depth of 2mm HG until a depth of 1.5mm HG was achieved. Holding period of six hours at a minimal rise of 100 microns. Charged system with 2000 lbs. of RS-45. Initial start-up: At the initial startup after conversion, the system was not exposed to significant load conditions. A steam heat exchanger was utilized to simulate minimal heat load conditions. Each compressor was started and allowed to carry the load independently. All compressors performed load demand tasking with exceptional performance operation. Each test resulted in a low discharge pressure of 160 PSI. Suction pressure was easily achievable at 50 PSI and oil pressure was ranging from 45 lbs. to 65 lbs. DP. 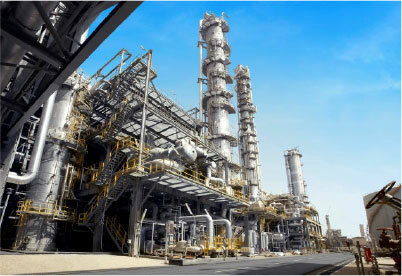 At that time, compressors were run under low load conditions. Day 3 of testing: Load requirement demands were increased to normal operating conditions of system requirement. Upon exposure to additional heat load requirements, the increased amount of suspended vapor dropped the liquid receiver level to below desired level. An additional 500 lbs. of RS-45 was added to meet the demand requirements of the normal operating conditions (heat load demand). Due to the low ambient conditions, the system still operated with relatively low discharge pressure of 175 PSI. Suction pressure was still easily achievable at 50 PSI and oil pressure DP was achievable. The approach on the evaporator dropped to 10°F (from 15) due to a lack of excessive oil in the evaporator. Furthermore, it appears that the retrofit should be considered easily achievable and the outcome should receive satisfactory results. Also the close pressure temperature relationship characteristics would not require substantial PLC control modifications or PSV replacement. As the working pressures of RS-45 (R434A) are lower than 24 bar, there was no need to change the safety valves and other parts rated to 24 bar (348 PSI) which would have been necessary with a conversion to R404A, R507, R422A or R428A. Since RS-45 (R434A) is compatible with all refrigeration oils, including mineral oils, installations using this lubricant do not need to move to a POE, which would have been necessary with R404A, R507, R407C or R427A, thereby reducing the conversion time, cost of oil, emergence of new leaks and the constraints imposed by the use of very hygroscopic lubricants. RS-45 (R434A) low temperature glide of 3°F enables the system to be directly charged with RS-45. From a technical standpoint, there is no need to remove the remaining refrigerant because no fractionation of the mixture would occur as would happen with R404A and R507. However, good practice protocol and EPA guidelines call for refrigerants not to be mixed. RS-45 (R434A) achieves good condensation and it is therefore unnecessary to change the condensers or make any changes in this regard as would be the case with R404A and R507. Owners can continue to use an A1 safety classification product, thus avoiding toxic or flammable chemicals like ammonia and hydrocarbons, respectively, which, amongst other things, also requires a major overhaul of facilities. 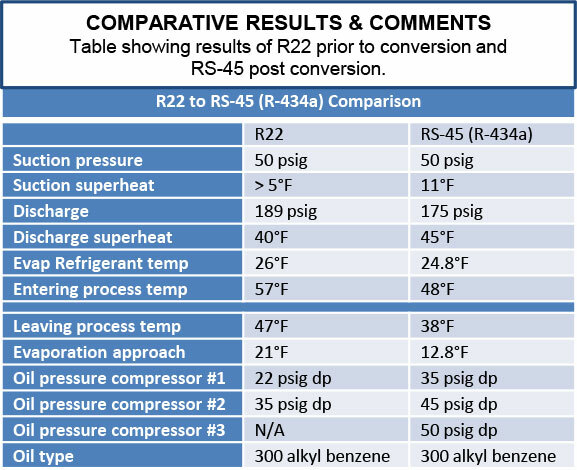 RS-45 (R434A) does not involve any significant loss of cooling power compared to R22 in contrast to what would happen with R422D, R417A, R407C and R427A.